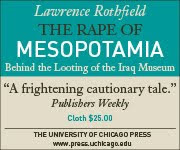 Lee Rosenbaum posts an anonymous report from a French archaeologist detailing the looting at Saqqara. It is notable that robbers began appearing very soon after the police abandoned their posts; that the military response at first was to make a show of force with a tank, but that that was inadequate to cow the looters; that the army did a good job protecting the Museum and magazines at Saqqara; and that the sites were secured on the third day after the start of looting. All in all, that is not a bad record. Let's remember that it took the US military six days to get around to arriving at the Iraq Museum to secure it, that almost nothing was ever done by the US military to protect Iraq's archaeological sites, and that as late as this fall, Iraq still had not reconstituted a functioning archaeological police, with only 50 out of 5,000 in place. CNN reports that a cameraman shooting on the square in front of the museum was dragged inside and his camera confiscated, and put in a pile of other cameras, by what he described as Mukhabarat or internal security officers. It seems that the museum has not just been protected by the military but also turned into a command post for the anti-democratic elements in the Mubarak government. This is a very dangerous development that carries with it the danger that the museum itself may become a target of enraged protestors if the situation turns violent again.